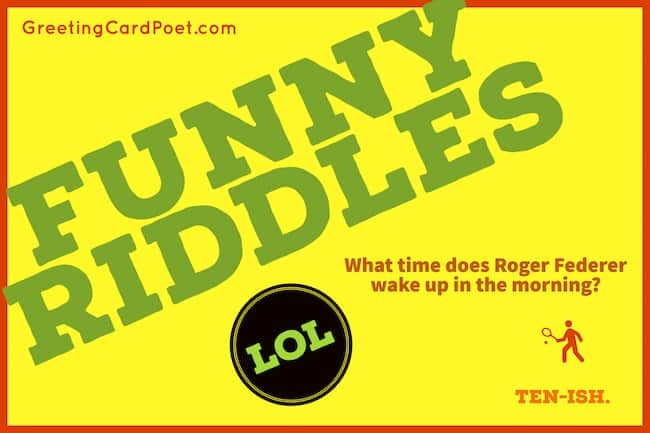 Our compilation of funny riddles are no joke! Let’s face it, they’re great for kids of all ages. There is something special about simple, gem-worthy wordplay that’s pretty appealing. 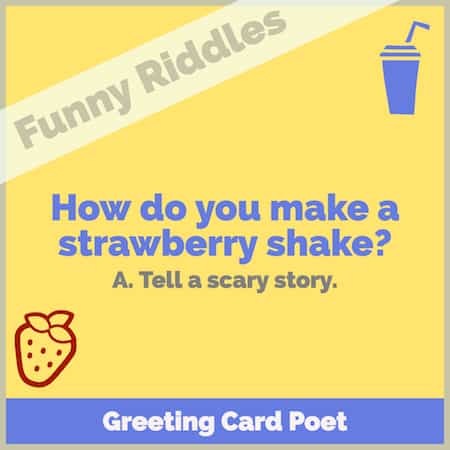 Be they silly, long or short, difficult or easy, riddles are enjoyed by all — and for good reason! Research tells us tricky riddles are beneficial for our minds. They not only engage the mind and make us think more creatively, but they also sharpen our memory and are especially great for improving cognitive problem-solving skills in children. That’s in addition to keeping kids entertained, of course. Far from long-winded punch lines, some of these are just too clever for their own good, so a thinking cap may be required. If you are up for the challenge, put your skills to the test, and try to solve these! Prepare yourself to laugh uncontrollably, or at least a little bit. The “show answer” is immediately after each riddle. Because they hit foul balls. How does the sky pay its bills? Where do zombies plant their flowers? What did the skeleton say after serving food in a restaurant? Bone-appetit. Check out our Best Puns page. Because they have the drumsticks. Where do vans go when it gets hot? Why did the orange wish he was wearing sunscreen? It was starting to peel. What do you call a train full of bubble gum? How do you catch a school of fish? What did the ghost put on his bagel? Where do sheep get their haircut? At the bah bah shop. What did Tony the Tiger wear to bed? Where do sailors take baths? Why couldn’t the sun read? It didn’t have his sunglasses. What is the strongest creature in the blue sea? 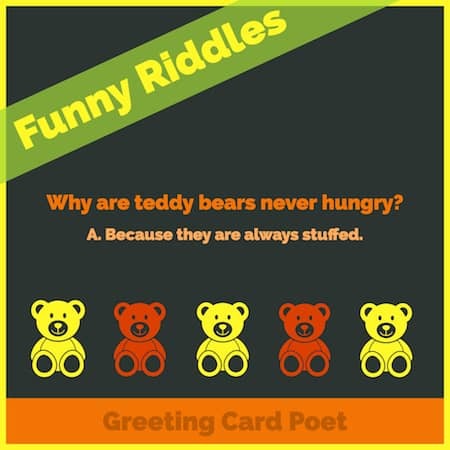 Tip: These funny riddles are great for including in kids’ lunches. Just write them on post-it notes or similar and drop them in. Your kids will love ’em. What day is a potatoes least favorite? What time does Roger Federer wake up in the morning? In a one-story pink house, there were a pink person, a pink cat, a pink fish, a pink computer, a pink chair, a pink table, a pink telephone, a pink shower. Everything was pink. What color were the stairs? There weren’t any stairs, it was a one-story house! Boom. They don’t wear socks they have bear feet. What kind of makeup do trees wear? What is black, white, and read all over?. What do geese have for breakfast? What do windows wear on a sunny day? Why can’t you play basketball with pigs? Because they hog the ball. What does a shark eat with peanut butter? What do you call a fairy that hasn’t taken a bath? Why did Peter Pan always fly and never stop? Because he could never never land. It belongs to you, but people use it more than you do. What is it? Take off my skin and I won’t cry, but you will, what am I? What does not ask questions but must be answered? The faster you run, the harder it is to catch me. What am I ?? 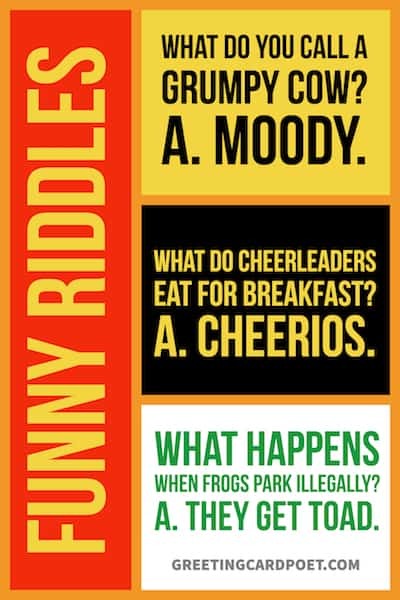 Teacher tip: Use these funny riddles when you have a few minutes before lunch or post on the chalkboard one per day. What has hands, but can’t clap? What has teeth, but cannot bite? I have a mouth, but never talk. What am I? Well, that does it! Ambiguous empirical findings aside, there’s no doubt that riddles are tons of fun when you exercise your mind from time to time. 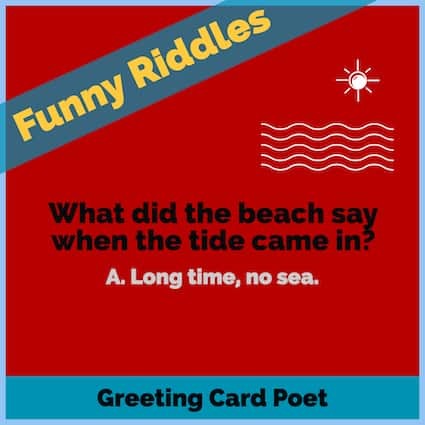 If you enjoyed these brain teasers with answers, please check back again for more and help us continue sharing the hilarity and fun with the world!